May 1988: Why would Craig Adler OD? That was what music journalist Laura Benton wanted to know. He’d been clean for months, everybody swore it. And with his band, he was about to sign a major label record deal, the first of the new Seattle wave to break out of the Northwest. But as she digs into the story the pieces don’t quite add up – and then the threats begin. Just a phone call at first, then a bullet and more until dreams turn to nightmares in the Emerald City and Laura finds herself desperately fighting for her reputation - and her life. Chris Nickson was born and raised in Leeds and first realised he wanted to be a writer when he was 11. As a teenager, though, music dug its claws into his soul, and for many years he played in the US, both solo and in bands like Harvey & the Larvae and Heat In The Room, that few people ever noticed. Finally, landing in Seattle, his passions met as he became a music journalist. Now, hundreds of interviews and thousands of reviews later, he lives back in England, still a music journalist, but also a novelist. 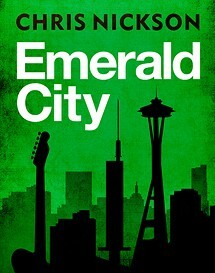 He’s the author of five Leeds-based Richard Nottingham novels, The Crooked Spire (set in 14th century Chesterfield) and now his love of music, crime and Seattle have come together in Emerald City.